Dr. Derrick Fox is the Director of Choral Activities and Assistant Professor of Music at the University of Nebraska-Omaha. He earned a BME from Arkansas State University, a MM in Choral Conducting from the University of Missouri – Columbia and a DMA in Choral Conducting from Michigan State University, where he was awarded the prestigious University Enrichment Graduate Fellowship. Dr. Fox has conducted all state choirs, honor choirs and led professional development workshops across the United States and internationally. 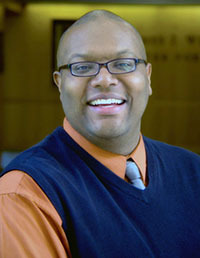 His professional workshops focus on assessment in the choral classroom, building classroom community, rehearsal strategies, choral conducting techniques and shape note singing in the African American community. Dr. Fox’s recent engagements included and teaching residencies at the Latvian Academy of Music and Syracuse University, performance tours through Lithuania and Estonia as well as conducting the 2018 Texas All State MS/JH Honor Choir and the SWACDA 7 – 10 Men’s Honor choir. Highlights from his upcoming engagements include presentations at Nebraska ACDA, Kansas ACDA, Kentucky ACDA, South Carolina MEA and North Dakota MEA as well as conducting the Hawaii All State Festival Choir, Alabama All State Choir, New York All State MS/JH Choir, and the National ACDA Middle School/Junior High Mixed Honor Choir. As a baritone soloist, Dr. Fox has collaborated with various organizations; among them are the Arkansas Symphony, Lansing Symphony, St. Louis Symphony, Columbia Chorale, the University of Nebraska at Omaha, University of Missouri, Michigan State University, Webster University and the Espaço Cultural (Brasilia, Brazil). He can be heard singing selections from Gershwin’s Porgy and Bess on the compact disc In This Hid Clearing, available on the Naxos Classical Music label. Dr. Fox is delighted to sing Elijah this season at the University of Missouri Columbia and with the Omaha Symphonic Choir. Dr. Fox serves on the National ACDA Diversity Subcommittee, the Missouri Music Educators Association Diversity Council and is the Collegiate Coordinator for Student Activities for Nebraska Choral Directors Association. As an author, he has written articles for many organizations and was a contributing author in the Hal Leonard/McGraw Hill choral textbook Voices in Concert. His compositions and arrangements are published by Hal Leonard Sacred Music Series, G. Schirmer Andrea Ramsey Choral Series and BriLee Music. His newest book, Yes You Can: A Band Director’s Guide to Teaching Choirs will be published by Brilee/Carl Fischer.